Despite the deteriorating security situation, there are some signs of progress in the field of disarmament, such as the intention of the Democratic People’s Republic of Korea (DPRK) and the United States to hold summit talks, a senior United Nations official said Monday. “At a time when global anxieties about nuclear weapons are higher than at any time since the Cold War, measures for disarmament and arms control are more vital than ever,” Thomas Markram, Deputy High Representative for Disarmament Affairs, told the opening of the 2018 session of the UN Disarmament Commission, held in New York. “Since September, there have been no fundamental changes in the interrelated trends that are eroding efficacy in arms control and negatively affecting international peace and security,” added Mr. Markram, as he delivered a speech on behalf of High Representative Izumi Nakamitsu. He stressed, however, that there have been some recent signs of progress that point to where the Commission can make a unique and constructive contribution. At a time when global anxieties about nuclear weapons are higher than at any time since the Cold War, measures for disarmament and arms control are more vital than ever. Positive developments also include the successful reduction of strategic nuclear forces by Russia and the US to the levels required by their New START Treaty. Looking to build on this momentum, the Commission has also included prevention of an arms race in outer space in its agenda for this session. “One specific collateral measure for disarmament on which this body should certainly be able to make a contribution is the goal of preserving outer space as a realm free of conflict,” Mr. Markram said, noting that several recent trends are impacting the security and sustainability of outer space activities. These include: the massive growth in the number and diversity of actors operating in outer space, including governments and the private sector; the proliferation of hazardous space debris; and increasing dependence on outer space in the civilian, government and military sectors. “As long as some continue to see outer space as a potential realm for war-fighting, we will face increasing risk of weaponization and conflict,” he said. However, there continues to be common ground among the major space-faring nations and other space actors on ways to make progress in a number of areas, including the implementation of transparency and confidence-building measures to mitigate misunderstandings and reduce risk, he noted. The Commission was created in 1978 as a subsidiary organ of the UN General Assembly, composed of all Member States, to consider various issues in the field of disarmament and make recommendations. Read more about today's debate here. 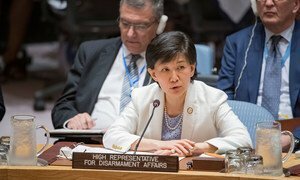 Izumi Nakamitsu has taken the helm of United Nations disarmament affairs at a time when needs are greatest for the world to invest in conflict prevention.